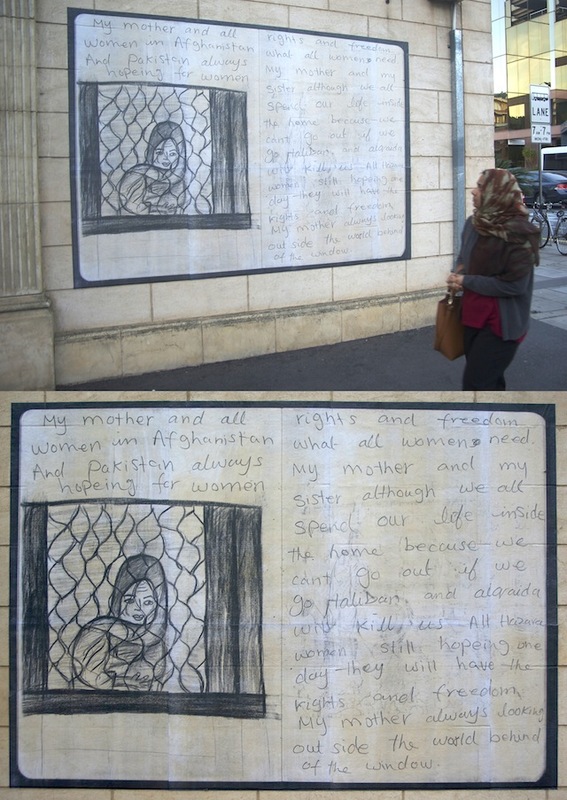 Australian street artist Peter Drew recently installed a series of wheatpasted drawings on the streets of downtown Adelaide, Australia. 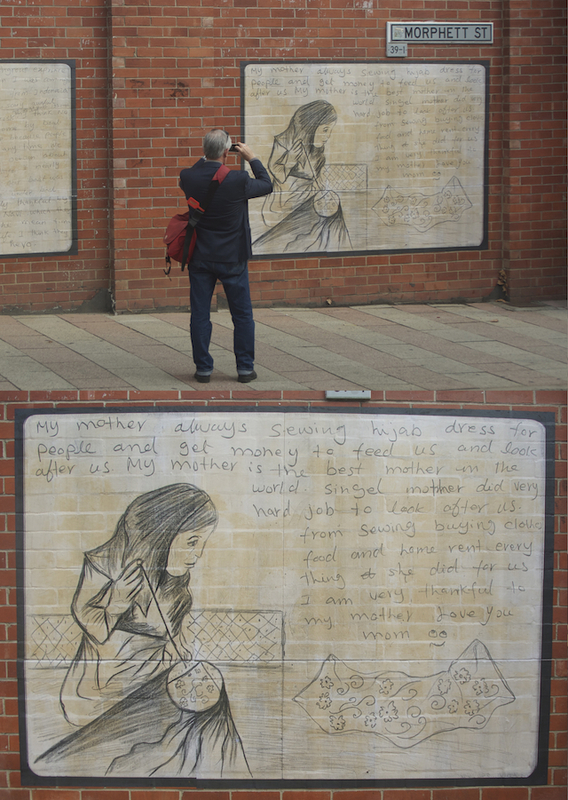 Of course, that sounds like what plenty of street artists do, except that these wheatpastes aren’t Drew’s design. 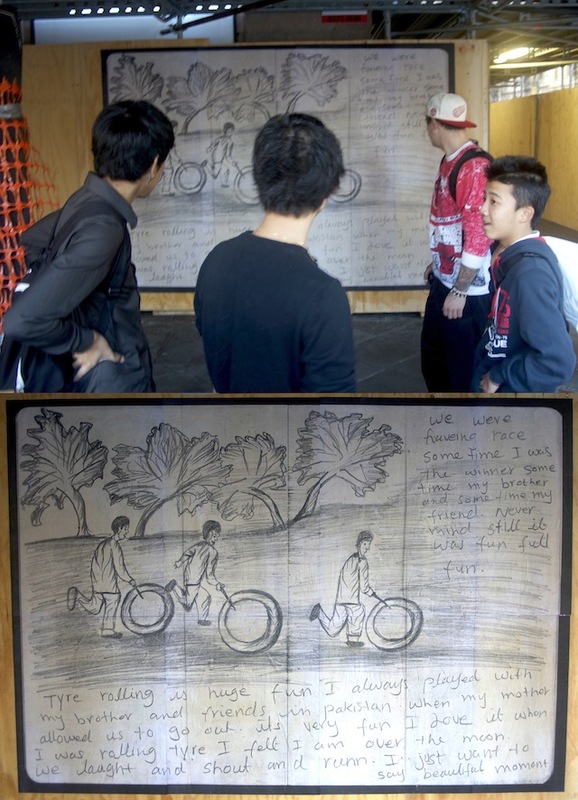 Each wheatpaste is a blown-up version of a drawing by a person seeking asylum in Australia. 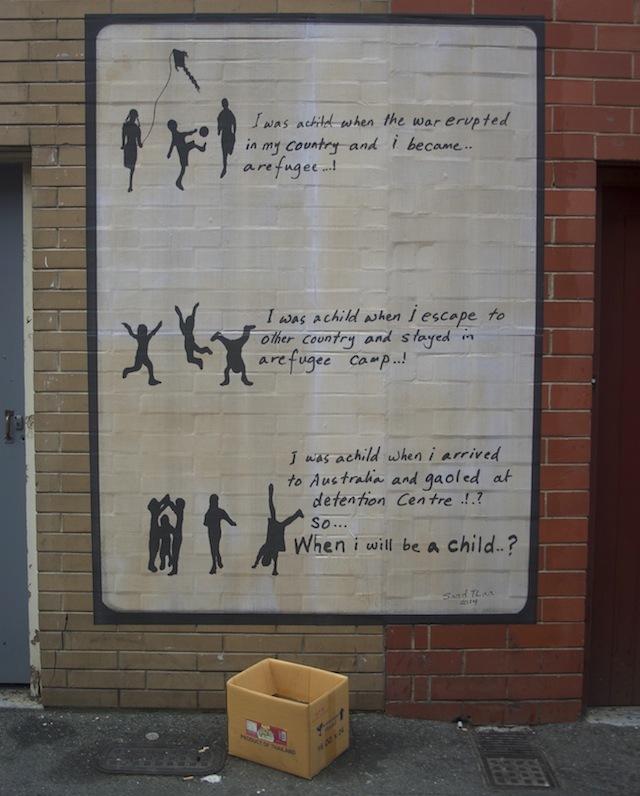 The project is an effort to take on the very very controversial immigration detention centers in Australia that those seeking asylum in Australia often spend a great deal of time in, and to humanize the asylum-seeking process in general. This isn’t the first time that these facilities have caught the attention of the art world, but Drew’s project attempts to give the issue a personal touch, which is somewhat less common. It’s an ethical juggle. The worst thing that could possibly happen from this project would be one of the participants being deported for their participation. For that reason I’ve only revealed the authorship of those participants who have already been issued a bridging visa. Even that took deliberation. There’s a deliberate lack of information from Australia’s Border Protection Force. They seem desperate to send a message to the world’s asylum seekers that Australia is unsympathetic to their plight. That’s why I wanted to protect the names of participants who might still be vulnerable as they could be targeted to be made example of. In some ways, Bound For South Australia is similar to JR‘s Inside Out Project, which essentially allows anyone to become a mini-JR using JR’s facilities, and both projects suffer from a similar flaw: authorship. Both projects are ostensibly about giving a voice to those who do not have one, amplifying those disenfranchised people’s voices through a megaphone provided by a well-known artist. Except in both cases, the “artist” is a white male who at the end of the day takes credit for the project, and the often non-white participants are somewhat left anonymous or effectively anonymous, arguably used as props by the “lead artist.” In both cases, there’s arguably a reason for that anonymity. JR and Drew have provided a voice to people living in dangerous situations, who may not be in a position to name themselves safely. These situations are probably entirely necessary. Still, they are ironic, and muddy the waters as to how much these projects actually humanize their subjects/participants. 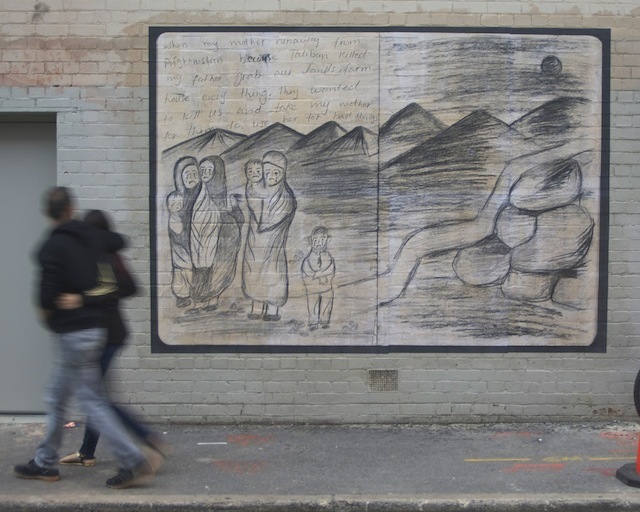 How well can Drew’s project humanize asylum seekers when journalists pick up on the project as a Peter Drew project and the names of the asylum seekers who drew the works that are on Adelaide’s walls, effectively relegated to the role of technicians, are kept secret? It is telling that even Drew seems to conceive of this as a Peter Drew artwork, not a series of 36 artworks facilitated or installed by Drew. What if, in Drew’s case, he had not actually claimed responsibility for the wheatpastes? Would an anonymously distributed press release, or a press release distributed by a human rights organization without Drew’s name, or no press release or explanation at all, have gotten the same attention for the project? I’m not sure. On some level, Drew is taking advantage of the very people he is trying to help, but I get the sense that such exploitation may be necessary for the success of the project, a project with the admirable goal of awareness about the asylum seeking process in Australia. Previous PostPrevious Who is Creative Placemaking?